For all types of dry fly patterns normally tied upside down. The Swedish dry fly hooks were designed in Sweden by Nils Eriksson and Gunnar Johnson who were well known Swedish fly tyers. Partridge first made them in 1979. Gary Lafontaine in his book "Caddis Flies" recommends them for a variety of Caddis (Sedge) dry fly imitations. Forged wide gape bend. Bronze finish. The finest dry fly hook we have ever made. Almost round forged Hamilton bend. Slightly longer shank dry fly hooks. (Also excellent for buzzers). Forged "Redditch" bend for extra strength. Bronze finish. upwing patterns. The long "front" of the hook coupled with an exceptional point makes for excellent hooking. Perfect for most upwing and loop wing patterns. Finish Black Nickel. Special dry fly hook developed with Peter MacKenzie-Philips in the 1970s. Bronze finish. The Yorkshire Fly Body hook will enable you to tie better balanced dry flies, with a better chance of hiding the hook. Dressing flies on Fly Body hooks is a two stage operation. Put the hook in the vice with the eye to the left. Start the thread on the point of the body, and tie in the tails and body materials. Complete the body, working to the left, until the top of the shank is reached, tie a half-hitch and then take the hook out of the vice. Put the hook into the vice with the eye pointing to the right, and complete the fly in the normal way. 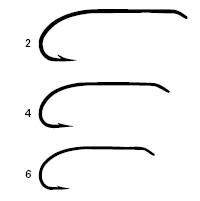 In about 1978 these hooks were very carefully developed with Vince Marinaro as the almost perfect hook for small dry fly patterns.They were offset because Vince felt that they hooked better, and they had a down turned eye which he felt allowed him to move the fly on the water in the right way. He strongly recommended tying them on with a turle knot which he believed did not lengthen the fly. They have a Bronze finish and a wide gape. The name says it all a perfect dry fly hook Finish Bronze. This hook in now exactly as designed by Hans can Klinken. It is now possible for us to make it according to the orginal plan. 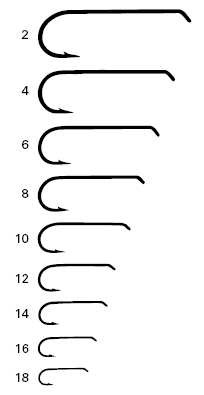 These grub/shrimp hooks were derived from a small fine wire plain shank hook which was used in Italy for plastic bloodworm imitations.They were given a down eye with an offset bend which made them good hooks and suitable for all types of grub, shrimp, curved body and some emerger patterns. Bronze finish. Sweeping bend for flies like caddis and emerger patterns. Straight eye. Black finish. 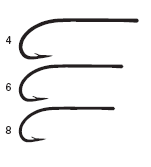 Oliver Edwards recommends these hooks in his book "Masterclass". They were developed specially for his small nymph and emerger patterns but are also good for dry flies. Straight eye. Silver Finish. Designed to offer a base for most standard wet fly patterns, a great allrounder. Finish Bronze. The basic nymph hook - about 2X long shank. (Also suitable for shorter streamer and attractor flies and for some larger dries). Forged bend. Bronze finish. The K12ST long shank Sedge/caddis hooks with a Grey Shadow finish. At last a pattern that matches the famous Czech nymph hooks used in the World Championships. The curved shank and in bold offset point are crucial to this design. The in curved and offset point gives very secure hookholds even though the design is barbless. These hooks are perfect for the weighted nymphs used in the "Czech" style of fishing. Finish Black Nickel. When we introduced our now already popular CZ Czech nymph last year we were asked to provide the same but with finer wire, and here it is. This hook made its debut last year and proved to be an instant success. An obvious one to be introduced in a leaded version. recommended them as very strong and effective dry fly hooks. The bend is offset. Bronze finish. The ideal hook for all types of wet flies and nymphs. This is the standard wet fly hook that we recommend for beginners. 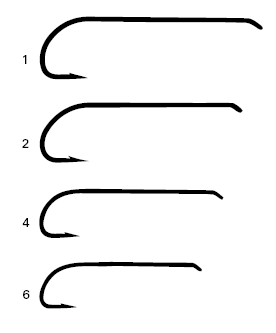 Forged Hamilton bend. Bronze finish. This old style of wet fly hooks is very well established in the Partridge range. However, there was a change in 1982 when the bend was forged to give hooks added strength.The traditional wet fly hooks with a limerick bend. Bronze finish. The perfect pattern for bucktail or streamer flies.Wide gape 4XL shank, 1extra heavy wire. 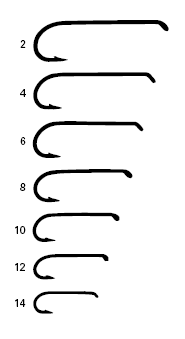 This range of hooks arose from the forged long shank hooks which had been Partridge’s standard hook for all types of long shank flies. The hook was made out of heavier wire and incorporates a wide gape. traditional streamer, bucktail and long attractor flies. The wide gape makes it good for flies like muddler minnows and other larger bodied flies. Traditional down eye. Bronze finish. streamer flies. Fine wire, but very strong. Looped down eye. Bronze finish. A fine limerick looped down eye hook for long streamer flies for trout. Black finish. For very long trout, streamer and pike flies. Looped down eye. Bronze finish.